What are you looking for? 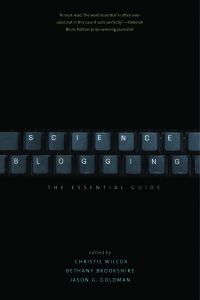 Below you can find links to pages filled with resources that helped inform Science Blogging: The Essential Guide. These links can help you get started, find your voice on the Internet or even help you take your blogging to the next level. If you are just getting started, start here. Check out resources to help you start a blog, use images with proper attribution, and learn more about the history of science blogging. There are also perspectives on blogging in and out of large networks, and on using shorter formats, such as Tumblr. There are many science blogs out there. Here, our chapter authors offer some tips on standing out from the crowd. There are resources for using personal experience and identity to help drive your writing. Our chapter authors also offer many different perspectives, from blogging as a tenure-track faculty member or as a graduate student to blogging as a public information officer. So you have a blog. Now what? Our chapter authors give advice on how to find an audience, how to tackle controversial topics, how to self-promote and how to embrace multimedia. They also offer perspective on ethics in science blogging. Finally, our chapter authors offer advice on how to get paid to blog and on how to take your work from blog to book.